Following my recent return from Bali, I thought I’d create a list of the Best Hotels in Bali giving you the lay of the land for you to plan your next trip. After returning to Bali the past 4 years in a row, I feel like I know certain areas of the island pretty well. This post takes into consideration both beautiful hotels and great shoot locations. Here is my list of the Best Hotels in Bali. The Chillhouse has to be my favorite hotel and the place I spent the most time on my last trip. Which is why it’s obviously first on the list for this Best Hotels in Bali review. It’s hard to put into words my deep love for this place but the best way to describe it is family. This year I had the pleasure of meeting the owner Alex, his energy is the exact reason The Chillhouse feels like home. The staff goes above and beyond to really make you feel valued. They remember you by name, and even memorize your breakfast order and allergies (always a win in my eyes)! The Chillhouse has 20 rooms on the property with the addition of the Chilla Villa right next door. Perfect for friends, this villa has 4 rooms and a private pool. They also have The Commune, a homestay with 3 bedrooms, a pool and a full-size kitchen making it perfect for families. This was my favourite place to stay. It’s right across the street giving you a little more privacy, but what makes it so special is the fact that this is actually the owners home. The walls are filled with adorable family photos and you feel the love radiate throughout the entire home. All accommodations at The Chillhouse include breakfast and 2 yoga sessions and they also offer extra services you can sign up for such as massages and surf lessons. 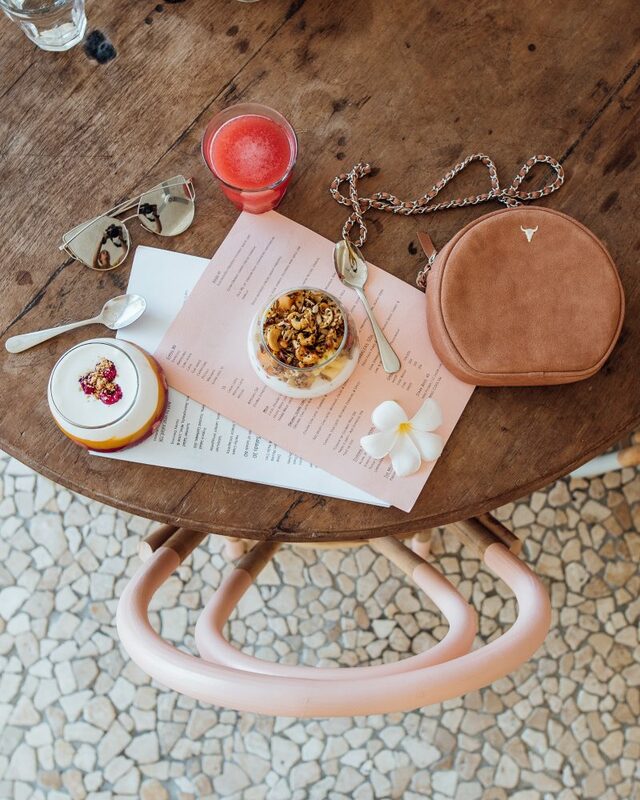 Located in one of my favorite areas in Bali, Canggu is filled with amazing vegan cafes and restaurants. The hardest decisions you will make in Canggu is always where to eat! The Chillhouse also just recently celebrated the opening of their new restaurant, Cassava, open to anyone coming for breakfast or lunch. The new menu is delicious and it makes for a perfect place to set up and work for the day. It became my regular office where I would reply to emails, edit and take calls from. And because everyone deserves a little break I would often work in a bikini so I could enjoy a 20 min break and cool off in the pool! I cannot recommend The Chillhouse enough if you visit make sure to mention @lisahomsy sent you! Also located in Canggu, The Jungleroom is one of the most unique and quaint hotels stays you will find. The Jungleroom is tucked away from the busy sounds of the street offering a very peaceful stay. 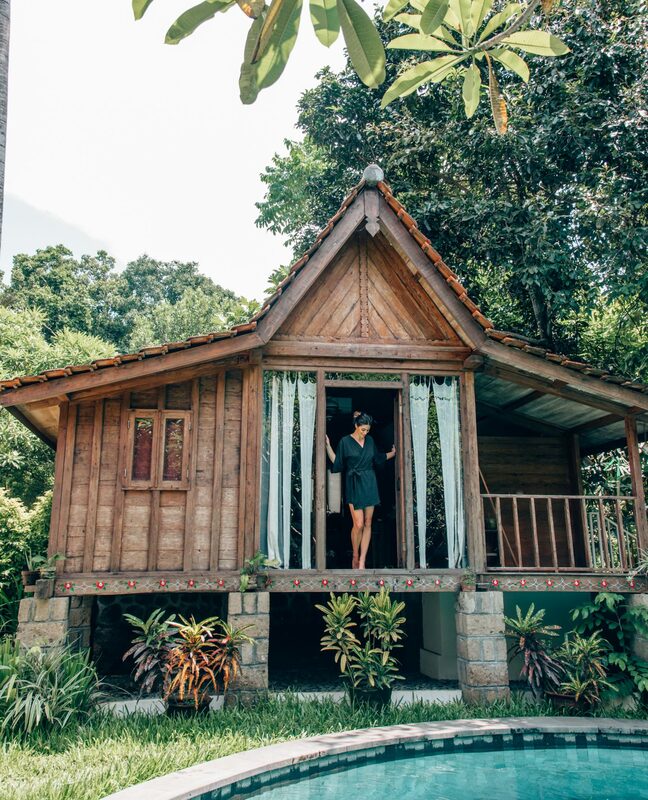 Rather than just the typical room, you stay in these adorable rustic homes; think cottage in the jungle. These houses are actually traditional teakwood homes imported from Sumatra, some aging up to 100 years old. I first discovered the Jungleroom last year when staying here with my mom and best friend. I fell in love with their accommodations that I couldn’t leave Bali without another night here. It’s very different from the typical accommodations you will find making it a great space to photograph. It’s not uncommon to see photoshoots going on here during your stay. Another reason to stay here is the breakfast. The Juice bar provides organic cold pressed juices and smoothies, young fresh coconuts, smoothie bowls and all day breakfast. Their motto ‘Eating is about freedom. Food should make you happy. To eat intelligently is an art – pure enjoyment, sharing, laughter, health, and nourishment.’ They also cater to vegetarian diets, with a few vegan, gluten-free and raw options. My favorite on the menu is the coconut chia pudding topped with huge chunks of fresh fruit! Welcome to heaven, flower tub heaven that is. 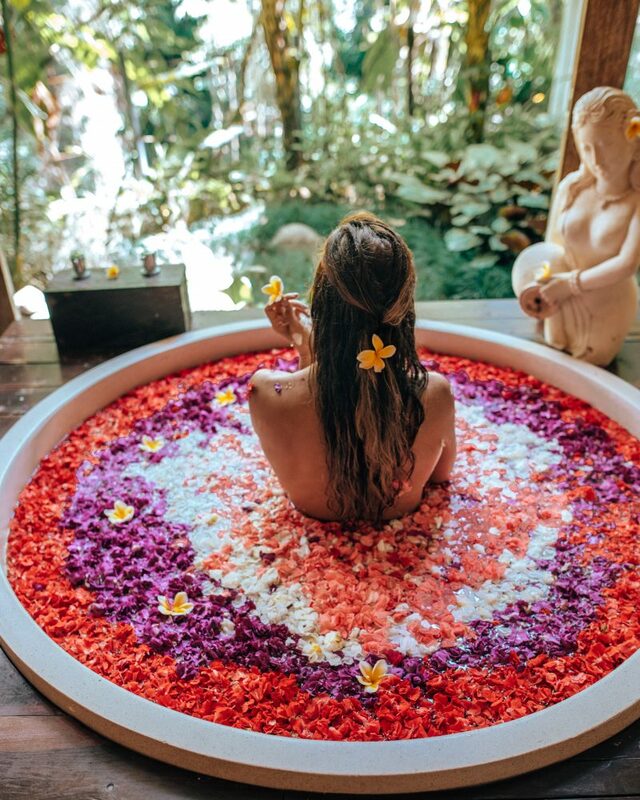 If you’ve recently looked at my Instagram feed and wondered where to find those dreamy #tubgoals shots look no further than The Udaya. While I didn’t actually stay here this time around (I was already booked elsewhere), I did come here on several occasions and it’s definitely on the list of places to stay for next time. I was initially invited to The Udaya to experience their spa and a 1 hour massage. The spa was so peaceful and offered the most delicious ginger tea. I also had one of the best massages of my life, I have never passed out so hard! After 10 mins I was still sound asleep and my friend had to wake me up haha. After the massage we were invited to enjoy the flower tub (they have one in every massage room) or relax in the jacuzzi (public). After falling in love with the property I organized with the owner to revisit with the girls from the Pangea Dreams Retreat** as a shoot location. Myself along with 13 women were welcomed to shoot around the property including the yoga space made completely out of bamboo, a spacious suite, and in the spa where they set up flower tubs for us. The staff went above and beyond not only setting up 1 tub for us but 2!! The thing that nearly brought me to tears was the owner and his staff surprised me with a special 3rd tub to celebrate my 200K Instagram milestone! This caught me completely off guard and never in my wildest dreams could I have imagined something more beautiful! The suite was spacious with tons of large windows letting in tons of natural light, a private pool overlooking Ubud’s tropical forest and a bathtub big enough for 2! The Udaya also offers other unique services such as floating breakfast (offered only in the villas) as well as daily yoga classes and free shuffle bus into the city center (only 5 mins away). Designed to capture the essence of a real-life Balinese village, the villas at Kamandalu Ubud have been built to respect the surrounding natural environment, each with its own unique character. 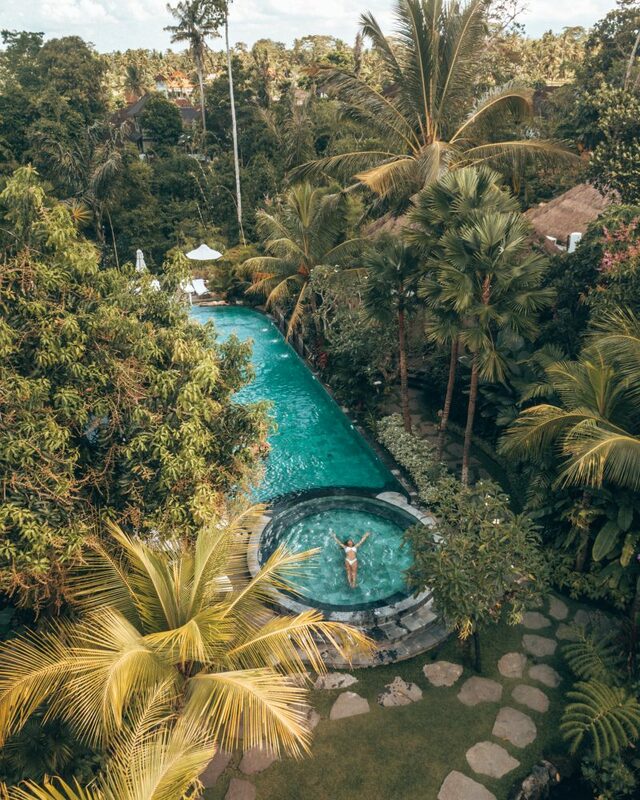 The hotel also has one of the largest swimming pools in Ubud complete with a swim-up bar (a rare find in Bali hotels), making it a great place to unwind and soak in all the beauty of Ubud. We arrived and decided to fuel up with lunch before shooting in the presidential suite. The restaurant had a wide-spread menu offering options for everyone’s taste buds. From pizza, pasta, burgers to traditional Indonesian dishes and a various number of vegetarian and vegan options. They also have a great selection of drinks and refreshing fresh pressed juices. For a more unique and romantic dining experience, you might consider the forest dining tree deck. It looks absolutely stunning! It’s a 6-course dinner on a deck at the edge of a tropical forest underneath twinkle lights to the sound of the river below. Sounds romantic, doesn’t it? The presidential suite has to be one of the most impressive rooms I have ever seen. The 2 floor, 3 bedroom villa is surrounded by a large swimming pool that looks out onto the Ubud valley. And the view from the second floor is absolutely breathtaking. 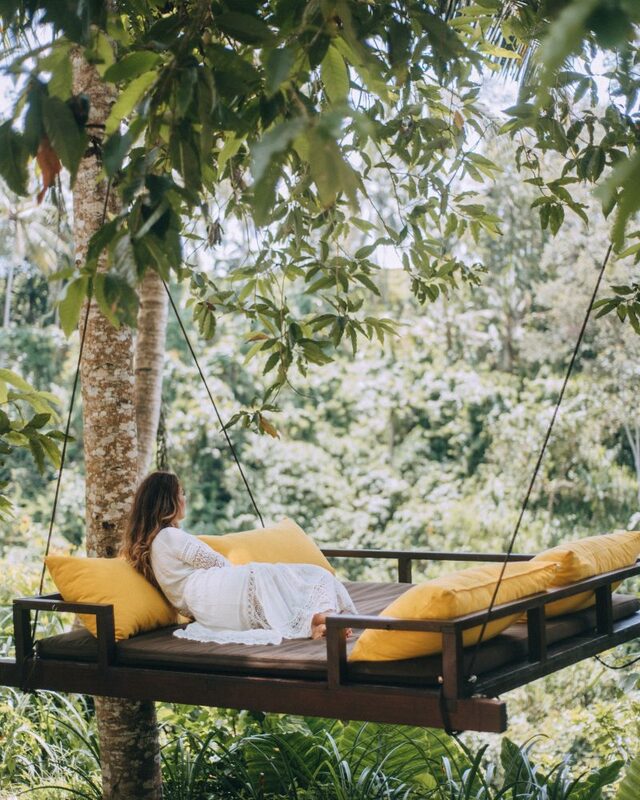 Other services Kamandalu offers are massages and a private swing in the forest, daily yoga sessions, and afternoon tea. Again I didn’t stay here this time around but my stay last year can’t go unnoticed, We actually stayed at their first hotel, La Joya but spent all our time at Biu Biu as it’s the better photo opt. Sitting right on the cliffs of Uluwatu La Joya Biu Biu is one of the most magical places to witness the sunset. Uluwatu is one of my favorite areas in Bali, the first time I was here I was totally amazed by the cliffs and their beauty. And hearing the waves crash against them is both powerful and so peaceful all at once. What makes La Joya Biu Biu truly unique is their spectacular cliffside infinity pools and jacuzzi. They have 3 infinity pools that trickle all into one another and the jacuzzi sits right on the edge. Both are perfect for a sunset beach shoot (which is exactly what I did!) See below. Despite the fact that when we stayed here we had monsoon rains and spent most of our time stuck in our room, our stay was perfect. The room was beautiful, it had a huge king size bed with wooden pillars as well as a single bed, perfect because my mom was with us. When we wanted to go to the restaurant it was a mad dash where even an umbrella couldn’t save us but we made the most of it and made sure to dance in the rain. Last on the list is Tijili, the hotel has the most adorable quirky decor from paint splattered on the floor to colorful props and wicker chairs in the lobby. The reason I love this property so much and have revisited 3 years in a row, their incredible staff! This time around I didn’t stay here but as I mentioned, I did stay here during my past visits. I feel like staff has been a common theme in all these hotels. Staff is the biggest factors in making your stay memorable, and the Balinese people are just so kind-hearted, customer service is always a top priority. It’s hard not to fall in love with everyone! ‘A stay at Tijili feels like dropping in on your hippest Balinese artist friend—the one with superb taste and a terrific sense of what’s happening.’ I pulled this line off their website and I couldn’t agree more, Tijili balances a combination of both trendy and traditional elements. The rooms are a little simpler compared to the hotels listed above but the beauty of Tijili lies in the common spaces such as the pool and lounge area. Poolside you have huge couches and bean bag chairs to lounge on or call your office for the day. The pool also has a really impressive jungle wall that makes a great backdrop for photos. Tijili is also very centrally located in Seminyak making it really easy to get around. You can walk to the beach or some of my favorite restaurants like Nalu Bowls and Shelter which are right around the corner. Or you can hop on a Go-jek (motorbike taxi) to take you anywhere you need to go. I hope this post was helpful when planning your trip to Bali (because Bali should be on everyone’s bucketlist!) Please let me know in the comments below your thoughts and what you want to see more of when it comes to Bali blog posts. I was thinking Best Cafes in Bali, Best Instagram spots… I’m open to suggestions. Thanks for including me on the blog. You are quite inspirational to me and I really enjoy the Instagram photographs and the updates. Safe travels! Thanks so much Christopher, I’m so glad to hear you can get inspired by it! Hi Lisa! For a first timer i Bali, where do you recomed to go? Or If combining two destinations, which should I choose? Yes you definitely need to visit Ubud, it’s so magical!!! Depending on what kind of beach you’d want I’d probably recomment Uluwatu. Great beaches, good surf (if you do surf). If you’re just starting out with surfing I’d recommend staying more in Canggu. The beach isn’t as nice but the waves are easier for a beginner. And if you have time the other option would be the Gili islands!! I use my presets! You can even get a free preset to try out on my website! This is so helpful, Lisa! 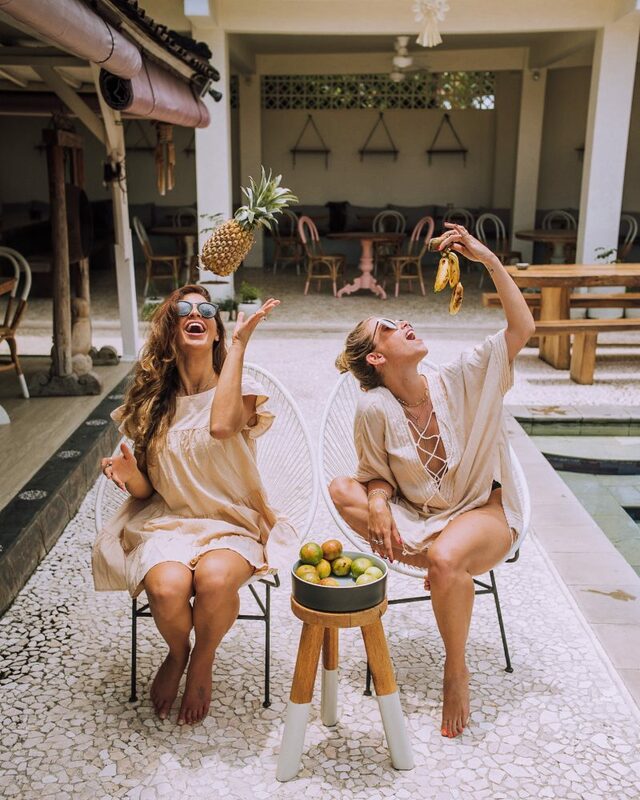 We’re going to Bali in October and really trying to work out where to spend our 8 nights – thinking Ubud, Canguu and Gili islands?! You need to go! You’d love it! That’s amazing to hear!! I’m working on several more Bali posts to come! Stay tuned! !